POSTCARD #153: Delhi: Getting things organized for the flight to Thailand, I go through my files and find this photo taken at Delhi Airport Departures last time I was there. 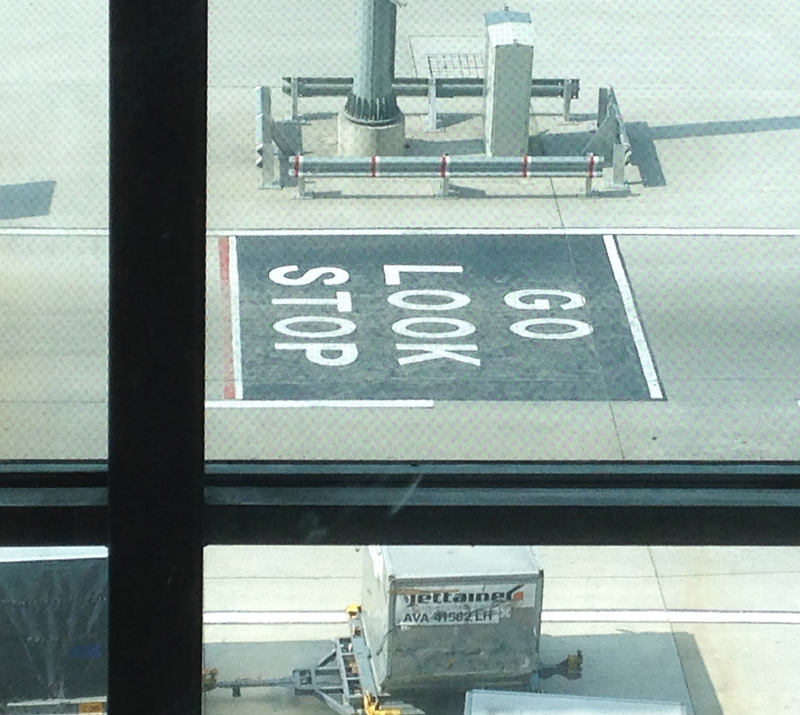 Unfamiliar with this kind of airport signage: STOP/ LOOK/ GO, I’m lost for a moment in the what-came-first directionality, then I see it’s meant to be for vehicles approaching from the left. The driver is supposed to stop at the word STOP, then drive to the word LOOK, then he is ready to GO. Curious incongruities for me, an observer at the window on the third floor of the passenger terminal, I feel like a tiny speck in a huge transparent glass and steel building. A time/space anomaly, I’m reminded of something somebody said; part of a conversation with a married couple I know, in Chiang Mai. German husband and Thai wife – she doesn’t speak German, he doesn’t speak Thai. They use English to communicate, husband speaks it with traces of Thai pronunciation, and wife has a slightly German accent. We’re having tea together and I’m the only native speaker in the room so I naturally start to facilitate their searching for words, then realise I don’t have to do that, of course – English is their link language and over the years they’ve worked out their own system. Their dialogue is a hybrid of grammar forms improvised as they go along. We’re getting ready to go out and husband says to wife, Where my blue socks. Wife tells husband: in the ironing basket… (mumbling quietly to herself in Thai: he can’t find anything because he doesn’t look properly). As he’s walking off to the laundry basket husband says, why you can move things without telling to me, and she follows it up with, I tell you before already. I lose track of the conversation then, thinking… before already, huh? Is it a point in time somewhere before ‘already’ happened? Or is it that she already told him about the socks, and that was before something happened that’s not referred to here. You can say it in Thai (bok gon laew*) but in English it suggests there’s an instant in time we are searching for but haven’t discovered yet. Miniscule shavings of time, events that last for 100 attoseconds, or 100 quintillionths of a second (note: 100 attoseconds is to one second as a second is to 300 million years). The illusion of duration, I’m experiencing a before/already disorientation, the present moment constantly updating itself in an attempt to find out where we are now. Cause and effect are parts of the same event; ‘before already’ is a screenshot capture of karma particles (cittas) in the time construct we inhabit. Lost in translation, so vast it doesn’t matter any more. in every pool, the one moon. For some reason it was an image from Omar Khayyam that came to mind, reading this. I think that’s why I’ve always liked Omar… He (or Fitzgerald’s translation) manages to capture in few words some of the concepts for which there are no words. Something about the closer you get to the Centre, the less distance there is between the spokes of the wheel, perhaps. As far as I know there’s zero experimental evidence for it but the theory can be used to plug holes in other theories. In particular it’s claimed to be a potential bridge between quantum theory and special relativity. But when I see this sort of stuff I’m not only reminded of all the other materialist ‘bridging theories’ than failed to pan out (e.g. phlogiston) but also of the many other failures of inductive reasoning that litter the history of science (e.g. the idea that because waves propagate through media – water, air, etc – there must be a medium called ether that transmits electromagnetic waves). My gut instinct is that it’s wrong because it still assumes time is linear and unidirectional. I am enjoying your reflections on time. People who had NDEs, report that the life review is like a huge 3d cinema where all the scenes are available for replay at once. Which one they want to revisit is just a matter of focus. Ramesh Balsekar said that time is like a huge tapestry with lines on it. When we are trapped in the two dimensioal tapestry, then we have only the small now moment, and there is a past and a future. But once we step into the third dimension, step away from the tapestry and look at it then we can see all the lines of past and future are all there together. All are there simultaneously. There are these two dimensional ant hills available as toys for observation, called AntWorks. (Pictures are available on the web). We are like these ants crawling through the tunnels, unaware of the fact that a step aside into another dimension will give us an overview of our map. That step aside into the other dimension is when we enter deep meditation and rest in awareness or during dreams. Sometimes glimpses of the future come through. Good morning Tiramit. I’m enjoying your blog. I wish you safe passage to Thailand and home again. I am finding myself drawn to the Forest traditions even as I follow the teachings of zen master Thich Nhat Hanh. This journey into the dhamma/dharma is amazing for me, drawing me ever deeper into transformation of my behaviors, cognitive and values. I listen to meditations by Ajahn Achalo and find them rich and helpful to this end. Hi Sonnische, thanks and good to hear from you again. It’s evening here and I just received your comment. Tomorrow I have to finish packing for Thailand on Tuesday and while I’m there I might have an opportunity to visit a Forest monastery. My first influence was Ajahn Jayasaro in 1994, he has a retreat in Chiang Mai in January. I have heard of Ajahn Achalo and seen photos of him during his visit to Dhammapala monastery in Switzerland. I find the Ajahn Chah tradition provides a structure that includes everything in body/mind. This is it, no kidding. In slow motion it looks like two events – although, at this moment, it feels like everything is in the future, just arrived in Ch’mai from Delhi. Are you in the South of Thailand now? Heading to Bali tomorrow. Back to Ch’mai Oct 28. I think we’re gonna miss.